The Tree Kangaroo Conservation Program (TKCP) is the Woodland Park Zoo’s signature international conservation program, focused on conserving the endangered Matschie’s tree kangaroo (Dendrolagus matschiei) and the habitat in which it lives. From its beginnings in 1996 to determine the status of the endangered Matschie’s tree kangaroo in the wild, TKCP has evolved into a holistic program supporting habitat protection for a wide range of threatened species, as well as initiatives to enhance local community livelihoods and access to government services. 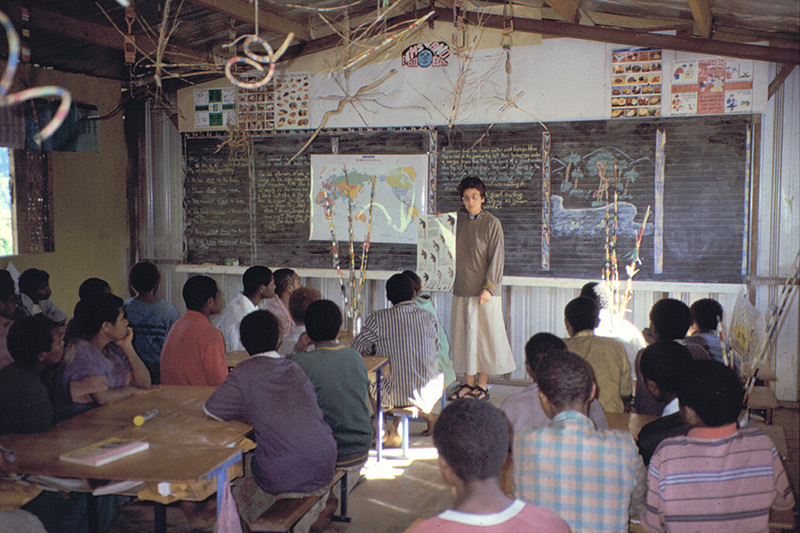 Over the course of nearly two decades, the program has grown from its mountainous roots to embrace a broad landscape encompassing marine and coastal reef ecosystems, lowland and montane rainforests, alpine grasslands, and the agricultural areas and settlements belonging to more than 50 villages within the Yopno, Uruwa, and Som (YUS) watershed areas on the Huon Peninsula. Together with the local landowners in YUS, PNG Government, Conservation International, and many other supporters, TKCP helped to establish the country’s first nationally-protected Conservation Area in 2009. A Category VI IUCN Protected Area, the YUS Conservation Area is the first and only protected area of its type in PNG –providing protection at the landscape scale, wholly owned by local people, and with the support of the PNG Government for long-term protection. The YUS Conservation Area provides the highest level of land protection in PNG and encompasses core land parcels pledged by clans to conservation and buffer areas of mixed use, covering an area of over 180,000 acres (78,700 hectares) in and around the Yus Local Level Government – an area twice the size of the city of Seattle! The YUS Conservation Area extends from the coast of the Bismarck Sea to 4,000-meter peaks in the Sarawaget mountain range, preserving a complete altitudinal spectrum of Huon Peninsula habitats free from resource extraction. The YUS Conservation Area protects more than 760 square kilometers of pristine forest habitat – twice the size of the city of Seattle. Under PNG’s customary land tenure system in which local people own and control over 90% of the land, long-term habitat protection relies on the commitment and participation of the local communities who depend on the forest’s products and services. 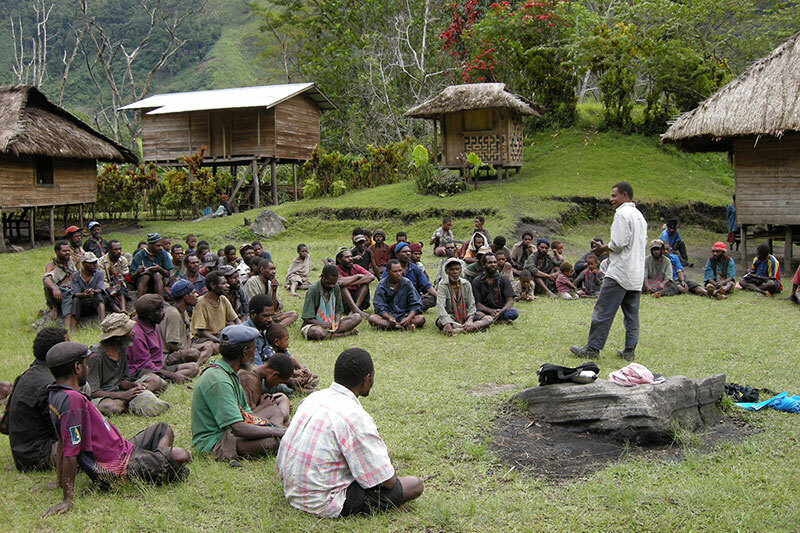 Together with local landowners and communities, TKCP partners with the PNG government agencies, conservation organizations, universities, research institutions, and other NGOs to build local capacity for the sustainable management of the YUS Conservation Area and the surrounding landscape. To ensure the long-term sustainability and local management of the YUS Conservation Area, TKCP established a local NGO, TKCP-PNG, based in Papua New Guinea to implement the program. In partnership with Conservation International and the Woodland Park Zoo, TKCP also established a $2 million endowment to support the management of the YUS Conservation Area in perpetuity. Through these partnerships, local residents build a strong connection between their commitment to conservation in YUS with better opportunities for their families and communities. With two decades of effort and experience, TKCP has shaped the concept of conservation for the country. The YUS Conservation Area sets a benchmark for which national protected areas can aspire. To encourage the creation of other nationally-protected conservation areas in Papua New Guinea, TKCP and Conservation International published Lessons Learned from the Field: Achieving Conservation Success in Papua New Guinea to serve as a guide for other practitioners of community-based conservation in PNG. TKCP and YUS CA are selected by the Global Environment Facility (GEF) and the government of Papua New Guinea to serve as a national model for community-based conservation. 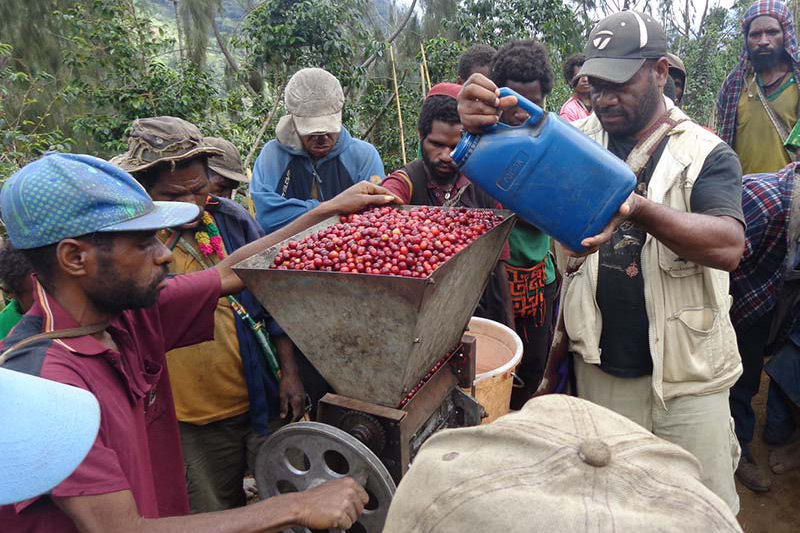 The YUS Conservation Coffee initiative expands across Yopno, Uruwa, and Som; exports to Caffe Vita increase more than 100%. Protection is expanded for marine ecosystems in YUS with the launch of a community-based marine monitoring program in coastal villages. Community-led Land-use Planning is completed across all wards in YUS. TKCP receives the United Nations Equator Prize and its second AZA International Conservation Award. YUS Conservation Area Bylaws gazetted by PNG’s national government. TKCP-PNG is registered as a local nongovernmental organization in Papua New Guinea. YUS Landscape Plan approved by PNG government. The YUS Conservation Endowment is established at the Woodland Park Zoo. First export of YUS Conservation Coffee to Caffe Vita in Seattle. Team of 12 YUS Conservation Area Rangers is established. YUS Ecological Monitoring Plan developed. The YUS Conservation Area is formally gazetted by PNG’s national government, protecting 78,000 hectares of wildlife habitat. The local landowner association is officially incorporated as the YUS Conservation Organization. YUS communities host an international celebration of the YUS CA gazettal. First National Geographic Society’s Crittercam® deployed on tree kangaroos. First YUS Teacher’s Scholarship students graduate and return to teach in YUS communities. First radio-collaring of tree kangaroos in Wasaunon. TKCP’s efforts amplified with support of large grants from Conservation International (2005-2014) and the German Development Bank (KfW) (2008-2014). TKCP receives the AZA International Conservation Award. Tree Kangaroo Conservation Program begins its work in YUS. First land pledged for conservation by YUS Landowner Mambawe Manaono. First tree kangaroo research in Dendawang, Sibidak and Pum Pum.